After 40 years in the floor coatings business, we’ve worked with countless businesses, manufacturers, retailers, and even those in the healthcare and community services fields. As we work with clients to determine the best flooring solutions for their needs, we find ourselves recommending epoxy floor coatings time after time. An epoxy coating is made up of two parts—a polyepoxide resin and a curative. They are mixed immediately before they are applied to your floor, and the resulting reaction causes them to chemically bond to one another and to the floor itself. This makes for a coating that is stronger than the sum of its parts. Epoxy is extremely durable and won’t peel or chip away from the flooring surface—that is, as long as it was cleaned and prepared properly beforehand. You can read all about the surface prep process on our in-depth page, but suffice it to say that lazy or improper surface preparation means your epoxy floor could fail almost instantly. One of the worst culprits is moisture. High humidity or vapor permeating the concrete flooring can prevent the adhesive bonds from forming while severely slowing the curing process. This is why it’s vital to get a professional moisture test done first, and have any problems dealt with before applying an epoxy. The difference? Epoxy flooring provides added structural support, while a coating is just creates a protective layer. While we most often talk about epoxy being applied to concrete floors, epoxy can also be used to provide a protective layer to any hard surface, including metal and wood subflooring. But again, these surfaces must be prepared carefully to ensure the epoxy bonds properly to the floor. “Flexible” does not sound synonymous with “strong,” but flexible-grade epoxy floors are much stronger than their rigid counterparts, especially in terms of abrasion resistance. 6. Epoxy Flooring Can Be Beautiful! The phrase “industrial floor coatings” may not conjure up beautiful images, but epoxy floors can come in a stunning variety of shades, colors and effects. You could even apply an epoxy with a metallic sheen that resembles a shimmering ocean or desert landscape to make a bold statement. Different colors may be applied in stages, creating dazzlingly colorful patterns that light up your facility. There is next to no limit for what epoxy can do. Non-slip layers can be added with embedded quartz. 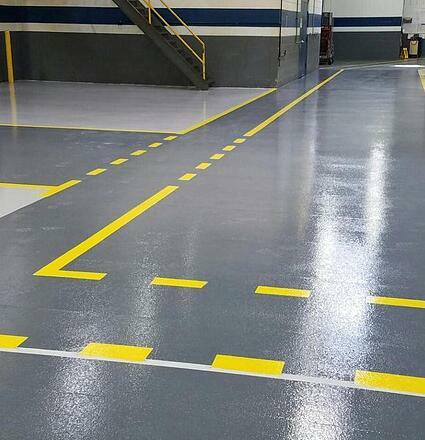 A urethane topcoat seals off epoxy and creates one of the most durable commercial surfaces available. Epoxy combined with a gravel-like aggregate can create durable, attractive, outdoor-ready surfaces. The end product looks like a rice crispy treat, with hard gravel or pebbles stuck together by an epoxy adhesive. Do be aware that direct sunlight exposure can cause chemical reactions in epoxy floors that make them appear to turn yellow or develop a “chalky” quality within the surface layer. You can avoid this problem by choosing to apply a UV-resistant coating, or simply limiting the surface’s exposure to direct light. Epoxy appears to “set” quite quickly, but just because it appears hard does not mean it is ready. It takes a minimum of 18 – 24 hours before it can be safely walked upon. Complete curing, where epoxy takes on its final form and hardness, can take as long as 30 days. Cooler temperatures slow this process. In fact, application in temperatures under 60 °F is not recommended since curing takes far too long and can create problems. Cheaper epoxies have as little as 30% to 40% solids by volume, meaning that once the product dries you are left with 40 percent or less thickness. Professional products are typically 90% to 100% solids by volume, leaving you with a better final product, and more of it. You also don’t want to skimp on labor costs. While a DIY approach to epoxy may work for your home garage, there’s too much at stake when you’re dealing with your business’ floors. It pays to hire an experienced crew to install your epoxy floor in order to avoid costly errors or a final product that doesn’t look quite right. If you’d like to learn more about the pros and cons of epoxy floor coatings, check out our epoxy hub page. To talk with an expert about whether epoxy is right for your facility, give us a call at (864) 855-0600 or contact us online. We’d be happy to help you find the best solution for your needs!